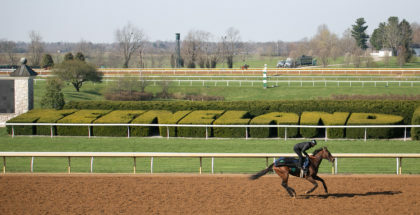 Red Oak Stable and Madaket Stables’ Hopeful Stakes (GI) winner Mind Control is the early 7-2 favorite for Saturday’s $500,000 Claiborne Breeders’ Futurity (GI) at Keeneland. Overall, the names of 14 juveniles were dropped into the entry box, all with connections who hope a victory in the 1 1/16-mile race will punch a ticket for their rising star to enter into the Sentient Jet Breeders’ Cup Juvenile (GI), thanks to the race’s Breeders’ Cup Challenge “Win and You’re In” status. 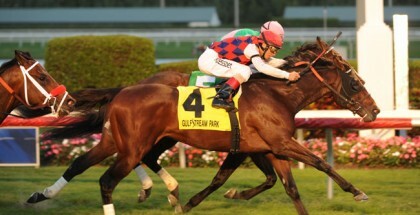 The Breeders’ Futurity has been scheduled as Saturday afternoon’s ninth race with a 5:14 p.m. ET post time. The rain showers in the area are forecasted to continue on Saturday, so a softer turf course and an off main track is possible, but to what degree will depend on what direction the storm track takes. It’s probably best to handicap for all conditions, just in case. Champion Classic Empire (2016) is the most recent Breeders’ Futurity winner to go on to Breeders’ Cup glory and since Tasso accomplished the feat in 1985, the two others to have joined the pair in pulling off the double are Favorite Trick (1987) and Boston Harbor (1996). The Greg Sacco-trained Mind Control broke his maiden at second asking at Monmouth Park prior to his Hopeful victory after finishing a solid second in his debut. He makes his two-turn and Keeneland debut at the same time, but the son of Stay Thirsty is bred to at least handle the 8 ½ furlongs. John Velazquez will be back aboard and surely working on a clean break for clear sailing toward the front, as post position 13 isn’t ideal for the front-running type. 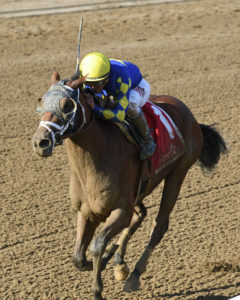 Also coming out of the Hopeful are Starlight Racing’s Sombeyay, John Oxley’s Dream Maker and Calumet Farm’s Derby Date. 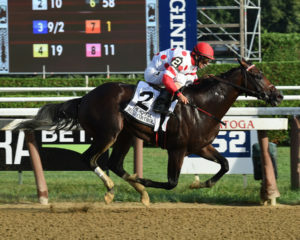 Trainer Todd Pletcher, who has two previous Breeders’ Futurity winners to his credit, will tighten the girth on Sanford Stakes (GIII) winner Sombeyay, who was fourth in the Hopeful last out. The son of Into Mischief, who has been in Kentucky for just a couple of days, will once again have Luis Saez aboard after a two-race absence and they will break from post position two. Mark Casse, who trained Classic Empire to victory here two years ago, sends out maiden winner Dream Maker, who was fifth in the Hopeful last out. The John Oxley homebred son of Tapit was a little green in his last and figures to improve with some extra experience. Regular rider Julien Leparoux, who was also Classic Empire’s jockey, has the mount and the two will break from post position five. The D. Wayne Lukas-trained maiden Derby Date, who was eighth in the Hopeful last out, seeks to give his Hall of Fame trainer a seventh win in this event, though he’s already secured his spot as the race’s leading conditioner. The Calumet Farm hombred son of Will Take Charge will surely like the added distance, as well as two. Gabriel Saez has the mount from post position 12. Peter Vegso’s Unionizer enters off a two-race win streak, including the Sapling Stakes at Monmouth Park at a mile five weeks ago. The Bill Mott-trained son of Union Rags is already successful around two turns and drew a decent post position of four to help out his early turn of foot under Florent Geroux and to get to the front early. He has room to improve even though this is a leap in class level. L and N Racing LLC’s Ellis Park Juvenile winner Tobacco Road returns to graded company after a very troubled fourth in the Iroquois Stakes (GIII) at Churchill Downs three weeks ago. The Steve Asmussen-trained son of Quality Road is surely better than that performance and figures to improve here. Corey Lanerie is back aboard after a one-race absence and the deep closer will break from post eight. The field for the Claiborne Breeders’ Futurity, with riders and odds from the rail, is: Signalman (Brian Hernandez Jr.), 15-1; Sombeyay (Luis Saez), 5-1; Fluminense (Ricardo Santana Jr.), 10-1; Unionizer (Florent Geroux), 10-1; Dream Maker (Leparoux), 5-1; Everfast (Jack Gilligan), 12-1; Knicks Go (Albin Jimenez), 30-1; Tobacco Road (Corey Lanerie), 12-1; Moonster (Tyler Gaffalione), 10-1; Mr. Ankeny (Robby Albarado), 12-1; Borracho (James Graham), 20-1; Derby Date (Gabriel Saez), 20-1; Mind Control (Velazquez), 7-2; and Standard Deviation (Javier Castellano), 10-1. All starters carry 121 pounds.